elobeatlesforever: Roy Wood: 69 (not 70) Years Old Today! Looking forward to Roy's 70th birthday ... in 2017! Hello ... Hello ... my old friends ... It's great to see you once again! 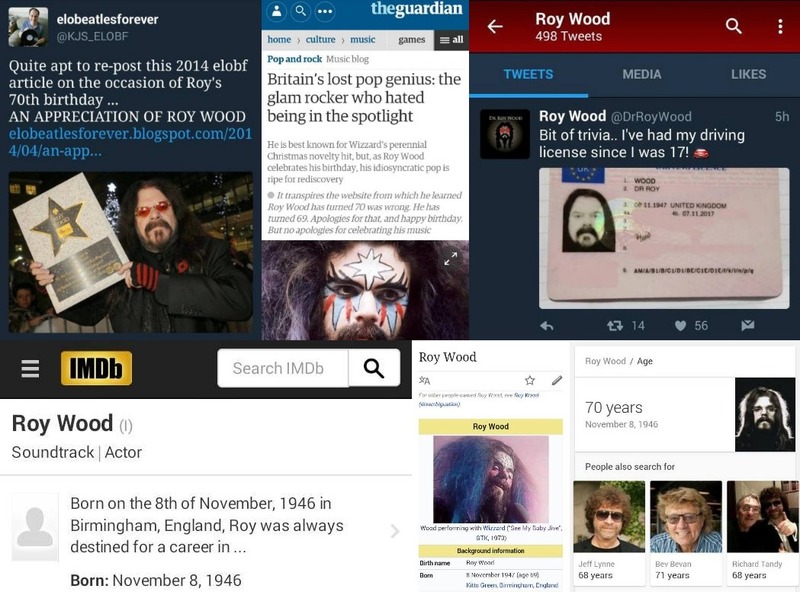 For some strange reason in the last few years, there has been not a little "Confusion" as to the age of Dr. Roy Wood. Today (Tuesday 8th November) is the birthday of the The Move, ELO and Wizzard founder and to some folks earlier today, it was also Roy's 70th birthday too. But in prematurely celebrating Roy reaching his own three score years and ten, even Yours Truly KJS posted congratulatory messages for Roy on Twitter and Facebook before The Guardian issued a correction and Roy himself confirmed that he is just 69 years of age today by posting a photograph of his Driving Licence via the official Roy Wood Twitter page showing his birth year as 1947. Roy Wood ... Have a bostin' 69th birthday!